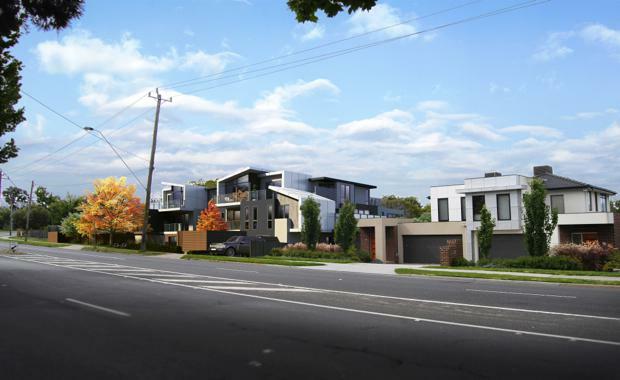 Two adjacent Ashburton properties with plans and permits for a new apartment development are on the market. Hamish Burgess, Ben Baines and Ted Dwyer of Colliers International have been appointed to sell a combined 1,450sqm at 322-324 High Street in Ashburton. “These two adjacent properties have plans and a permit for 19 luxurious apartments over three levels,” Mr Burgess said. “Ashburton is one of Melbourne’s most affluent suburbs, with a strong median house price well above $1.2 million and significant demand for apartments in the area. The properties are located moments from Ashburton Village, Ashburton train station, Chadstone Shopping Centre and Riversdale Golf Club. Having sold a number of similar sites in Melbourne’s eastern and south eastern suburbs in recent months, without permits, agents expect this permitted site to be hotly contested. 1520 High Street and 65 Erica Avenue, Glen Iris: Two neighbouring properties sold as a 830sqm residential development site to a local developer for $3.4 million. 831-835 High Street, Kew East: Two neighbouring properties, totalling 2,377sqm, sold to a Chinese developer for an undisclosed amount. 170-176 McKinnon Road, McKinnon: Four side-by-side properties sold on behalf of four neighbouring owners to local developer Citiplan Property for $4.18 million.